Gadolinium-based contrast agents (GBCAs) increase the risk for NSF among patients with impaired elimination of the drugs. Avoid use of GBCAs in these patients unless the diagnostic information is essential and not available with non-contrasted MRI or other modalities. NSF may result in fatal or debilitating fibrosis affecting the skin, muscle, and internal organs. • acute kidney injury [see Contraindications (4)]. • Screen patients for acute kidney injury and other conditions that may reduce renal function. For patients at risk for chronically reduced renal function (for example, age >60 years, hypertension or diabetes), estimate the glomerular filtration rate (GFR) through laboratory testing. 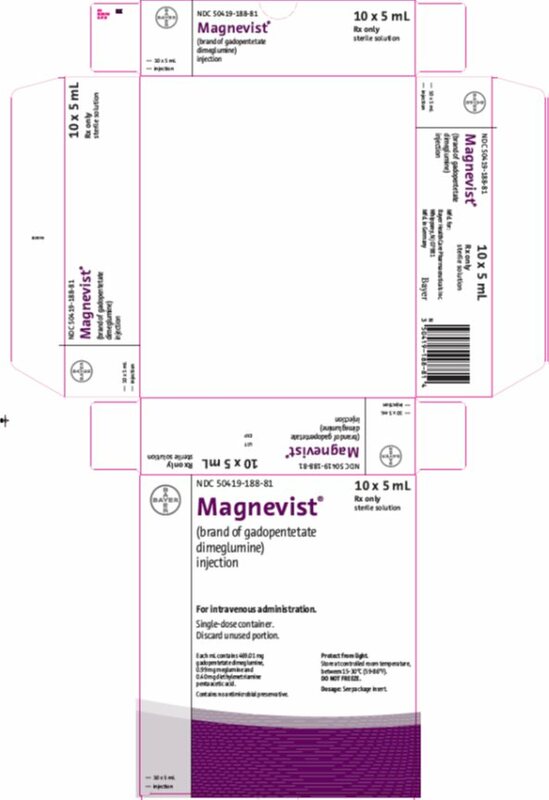 Do not exceed the recommended Magnevist dose and allow a sufficient period of time for elimination of the drug from the body prior to any re-administration [see Warnings and Precautions (5.1)]. These highlights do not include all the information needed to use MAGNEVIST ® safely and effectively. See full prescribing information for MAGNEVIST. • Screen patients for acute kidney injury and other conditions that may reduce renal function. For patients at risk for chronically reduced renal function (for example, age > 60 years, hypertension, or diabetes), estimate the glomerular filtration rate (GFR) through laboratory testing. To report SUSPECTED ADVERSE REACTIONS, contact Bayer HealthCare Pharmaceuticals at 1-888-84-BAYER (1-888-842-2937) or FDA at 1-800-FDA-1088 or www.fda.gov/medwatch. Magnevist injection is indicated for use with magnetic resonance imaging (MRI) in adults, and pediatric patients (2 years of age and older) to visualize lesions with abnormal vascularity in the brain (intracranial lesions), spine and associated tissues. Magnevist injection has been shown to facilitate visualization of intracranial lesions including but not limited to tumors. Magnevist injection is indicated for use with MRI in adults and pediatric patients (2 years of age and older) to facilitate the visualization of lesions with abnormal vascularity in the head and neck. 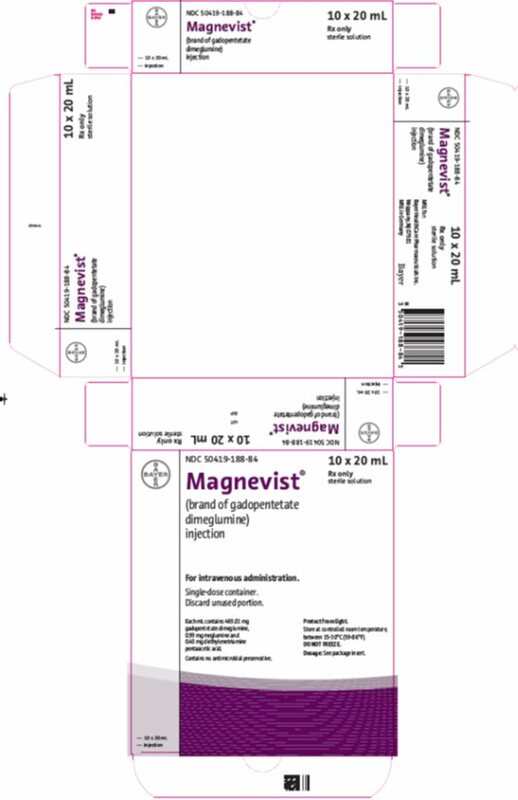 Magnevist injection is indicated for use in MRI in adults and pediatric patients (2 years of age and older) to facilitate the visualization of lesions with abnormal vascularity in the body. The recommended dosage of Magnevist injection is 0.2 mL/kg (0.1 mmol/kg) administered intravenously, at a rate not to exceed 10 mL per 15 seconds. Dosing for patients in excess of 286 lbs has not been studied systematically. To ensure complete injection of Gadopentetate dimeglumine, administer 5-mL normal saline flush after the injection. The imaging procedure should be completed within 1 hour of injection of Magnevist injection. Visually inspect for particulate matter and discoloration prior to administration. Do not use the solution if it is discolored, if particulate matter is present or if the container appears damaged. Discard any unused portion in accordance with regulations dealing with the disposal of such materials. 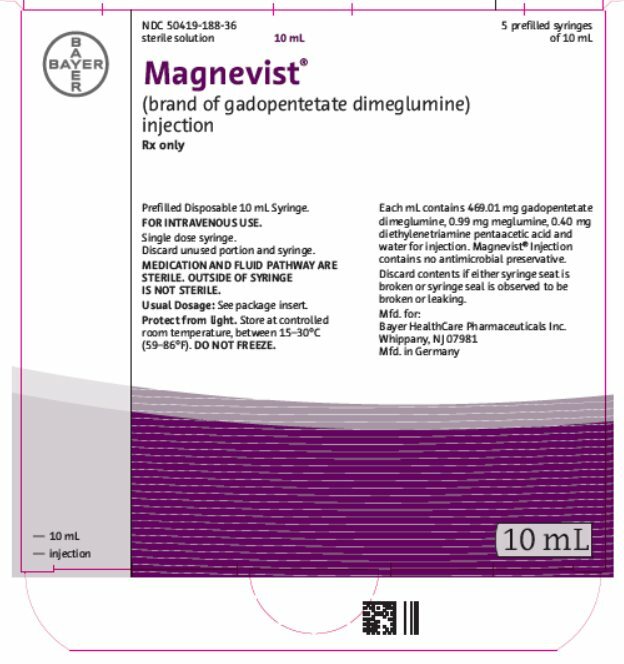 Magnevist is a clear, colorless to slightly yellow solution containing 0.5 mmol gadopentetate dimeglumine/mL (equivalent to 469.01 mg/mL of gadopentetate dimeglumine) for intravenous use. • History of severe hypersensitivity reactions to Gadopentetate dimeglumine. Gadolinium-based contrast agents (GBCAs) increase the risk for nephrogenic systemic fibrosis (NSF) among patients with impaired elimination of the drugs. Avoid use of GBCAs among these patients unless the diagnostic information is essential and not available with non-contrast enhanced MRI or other modalities. The GBCA-associated NSF risk appears highest for patients with chronic, severe kidney disease (GFR < 30 mL/min/1.73m2) as well as patients with acute kidney injury. Do not administer Magnevist to these patients. The risk appears lower for patients with chronic, moderate kidney disease (GFR 30- 59 mL/min/1.73m2) and little, if any, for patients with chronic, mild kidney disease (GFR 60- 89 mL/min/1.73m2). NSF may result in fatal or debilitating fibrosis affecting the skin, muscle, and internal organs. Report any diagnosis of NSF following Magnevist administration to Bayer HealthCare (1-888-842-2937) or FDA (1-800-FDA-1088 or www.fda.gov/medwatch). Screen patients for acute kidney injury and other conditions that may reduce renal function. Features of acute kidney injury consist of rapid (over hours to days) and usually reversible decrease in kidney function, commonly in the setting of surgery, severe infection, injury, or drug-induced kidney toxicity. Serum creatinine levels and estimated GFR may not reliably assess renal function in the setting of acute kidney injury. For patients at risk for chronically reduced renal function (for example, age > 60 years, diabetes mellitus or chronic hypertension), estimate the GFR through laboratory testing. Among the factors that may increase the risk for NSF are repeated or higher than recommended doses of a GBCA and degree of renal impairment at the time of exposure. Record the specific GBCA and the dose administered to a patient. When administering Gadopentetate dimeglumine, do not exceed the recommended dose and allow a sufficient period of time for elimination of the drug prior to re-administration [see Clinical Pharmacology (12.3) and Dosage and Administration (2)]. Anaphylactoid and anaphylactic reactions with cardiovascular, respiratory, and/or cutaneous manifestations rarely resulting in death have occurred. The risk of hypersensitivity reactions is higher in patients with a history of reaction to contrast media, bronchial asthma, or allergic disorders. Hypersensitivity reactions can occur with or without prior exposure to GBCAs. Have appropriately trained personnel administer Magnevist in a facility that has immediate availability of resuscitative equipment. If a hypersensitivity reaction occurs, stop Magnevist injection and immediately begin appropriate therapy. Observe closely patients with a history of drug reactions, allergy, or other hypersensitivity disorders, during and up to several hours after Magnevist injection. In patients with renal impairment, acute renal failure (acute kidney injury) requiring dialysis or worsening renal function has occurred, mostly within 48 hours of Magnevist injection. The risk of acute renal failure is higher with increasing dose of contrast. Use the lowest possible dose, evaluate renal function in patients with renal impairment, and allow sufficient time for contrast elimination before re-administration. Elimination half-life in patients with mild or moderate renal impairment is 3 to 4 hours. Elimination half-life in patients with severe renal impairment is about 11 hours. Magnevist is cleared by glomerular filtration and is dialyzable. After 3 dialysis sessions of 3 hours each, about 97% of the administered dose is eliminated from the body; each dialysis session removes about 70% of the circulating drug [see Clinical Pharmacology (12.3)]. Skin and soft tissue necrosis, thrombosis, fasciitis, and compartment syndrome requiring surgical intervention (e.g. compartment release or amputation) have occurred very rarely at the site of contrast injection or the dosed limb. Total volume and rate of Magnevist injection, extravasation of contrast agent, and patient susceptibility might contribute to these reactions. Phlebitis and thrombophlebitis may be observed generally within 24 hours after Magnevist injection and resolve with supportive treatment. Determine the patency and integrity of the intravenous line before administration of Magnevist injection. Assessment of the dosed limb for the development of injection site reactions is recommended. As with any paramagnetic contrast agent, Magnevist injection might impair the visualization of lesions seen on non-contrast MRI. Therefore, caution should be exercised when Magnevist MRI scans are interpreted without a companion non-contrast MRI scan. The mean age of the 1272 patients who received Magnevist injection in pre-market clinical trials was 46.4 years (range 2 to 93 years). Of these patients, 55% (700) were male and 45% (572) were female. Of the 1271 patients who received Magnevist injection and for whom race was reported, 82.1% (1043) were Caucasian, 9.7% (123) were Black, 5.3% (67) were Hispanic, 2.1% (27) were Oriental/Asian, and 0.9% (11) were other. The most common adverse reaction was headache (4.8%). The majority of headaches were transient and of mild to moderate severity. Other adverse reactions that occurred in â‰¥ 1% of patients included: nausea (2.7%), injection site coldness/localized coldness (2.3%) and dizziness (1%). General Disorders: Injection site reactions, including phlebitis, pain, localized warmth, localized edema, and burning sensation [see Warnings and Precautions (5.5)]. Substernal chest pain, back pain, pyrexia, asthenia, feeling cold, generalized warmth, fatigue, and chest tightness, and anaphylactoid reactions characterized by cardiovascular, respiratory and/or cutaneous symptoms, such as dyspnea, bronchospasm, and cough. Cardiovascular: Hypotension, hypertension, tachycardia, migraine, syncope, vasodilatation, pallor. Gastrointestinal: Abdominal discomfort, teeth pain, increased salivation, abdominal pain, vomiting, diarrhea. Nervous System: Agitation, anxiety, thirst, somnolence, diplopia, loss of consciousness, convulsions (including grand mal), paresthesia. Respiratory System: Throat irritation, rhinitis, sneezing. Skin: Rash, sweating (hyperhidrosis), pruritus, urticaria (hives), facial edema. Special Senses: Conjunctivitis, taste abnormality, dry mouth, lacrimation, eye irritation, eye pain, ear pain. The following additional adverse reactions have been identified during postmarketing use of Gadopentetate dimeglumine. Because these reactions are reported voluntarily from a population of uncertain size, it is not always possible to reliably estimate their frequency or establish a causal relationship to drug exposure. • General Disorders and Administrations Site Conditions: Adverse events with variable onset and duration have been reported after GBCA administration [ see Warnings and Precautions (5.3)]. These include fatigue, asthenia, pain syndromes, and heterogeneous clusters of symptoms in the neurological, cutaneous, and musculoskeletal systems . The most frequently reported adverse reactions in the postmarketing experience were nausea, vomiting, urticaria, and rash. General Disorders and Administration Site Conditions: Nephrogenic systemic fibrosis [see Warnings and Precautions (5.1)], body temperature decreased, tremor, shivering (chills), injection site reactions including skin and soft tissue necrosis. Hypersensitivity Reactions: Anaphylactic/anaphylactoid reactions that may be fatal and include cardiac or respiratory arrest, respiratory distress, cyanosis, laryngeal edema, laryngospasm, pharyngeal edema, and angioedema [see Warnings and Precautions (5.2)]. Delayed hypersensitivity reactions have been reported up to several hours after administration of Gadopentetate dimeglumine. Renal and Urinary: Acute renal failure, worsening renal impairment [see Warnings and Precautions (5.4)] urinary incontinence, urinary urgency. Vascular: Thrombophlebitis, deep vein thrombophlebitis, compartment syndrome requiring surgical intervention. Cardiac: Cardiac arrest, heart rate decreased, arrhythmia. Ear and Labyrinth Disorders: Hearing impairment. Musculoskeletal and Connective Tissue Disorder: Arthralgia. Nervous System Disorders: Coma, parosmia, speech disorder. Respiratory System: Respiratory arrest, pulmonary edema. There are no known drug interactions. Magnevist does not interfere with serum and plasma calcium measurements determined by colorimetric assays. GBCAs cross the placenta and result in fetal exposure and gadolinium retention. The human data on the association between GBCAs and adverse fetal outcomes are limited and inconclusive (see Data). In animal reproduction studies, repeated intravenous dosing of gadopentetate dimeglumine during organogenesis resulted in delayed fetal development in pregnant rats and rabbits at doses 2 times and 2.4 times, respectively, the recommended human dose (based on body surface area [BSA]). No teratogenic effects were observed in rats or rabbits at doses 7.3 times (rats) and 9.7 times (rabbits) the recommended human dose, based on BSA (see Data). Because of the potential risks of gadolinium to the fetus, use Magnevist only if imaging is essential during pregnancy and cannot be delayed. Gadopentetate dimeglumine was administered intravenously during organogenesis at doses of at 0.25, 0.75, and 1.25 mmol/kg/day for 10 consecutive days in pregnant rats and for 13 consecutive days in pregnant rabbits. Gadopentetate dimeglumine caused retardation of fetal development at a dose of 1.25 mmol per kg (rats) and 0.75 mmol per kg (rabbits); 2 times and 2.4 times, respectively, the recommended human dose (based on BSA). Gadopentetate dimeglumine was not teratogenic in pregnant rats and rabbits when given repeatedly during organogenesis at a dose of 3 mmol per kg in rabbits and 4.5 mmol per kg in rats; 9.7 times and 7.3 times, respectively, the recommended human dose (based on BSA). Limited literature reports that breastfeeding after gadopentetate dimeglumine administration to the mother would result in the infant receiving an oral dose of 0.001 to 0.04% of the maternal dose. There is no information on the effects of the drug on the breastfed infant or the effects of the drug on milk production. Additionally, there is limited GBCA gastrointestinal absorption. The developmental and health benefits of breastfeeding should be considered along with the motherâ€™s clinical need for Magnevist and any potential adverse effects on the breastfed child from Magnevist or from the underlying maternal condition. Intravenous injections of gadopentetate dimeglumine (16 to 18 doses over 23 to 25 days) caused spermatogenic cell atrophy and degeneration that was irreversible in male rats at a dose of 8 times (based on BSA) the recommended human dose [see Nonclinical Toxicology (13.1)]. The use of Magnevist in imaging the central nervous system, extracranial/extraspinal tissues, and body have been established in the pediatric population from the ages of 2 to 16 years on the basis of adequate and well controlled clinical trials in adults and safety studies in this pediatric population [see Clinical Studies (14)]. Safety and efficacy in the pediatric population under the age of 2 years have not been established. Magnevist is eliminated primarily by the kidney. In a study with pediatric patients aged 2 months to < 2 years the pharmacokinetics (body weight-normalized clearance, body weight-normalized distribution volume, and terminal half-life) of gadopentetate were similar to adults. Systemic consequences associated with overdosage of Magnevist injection have not been reported. 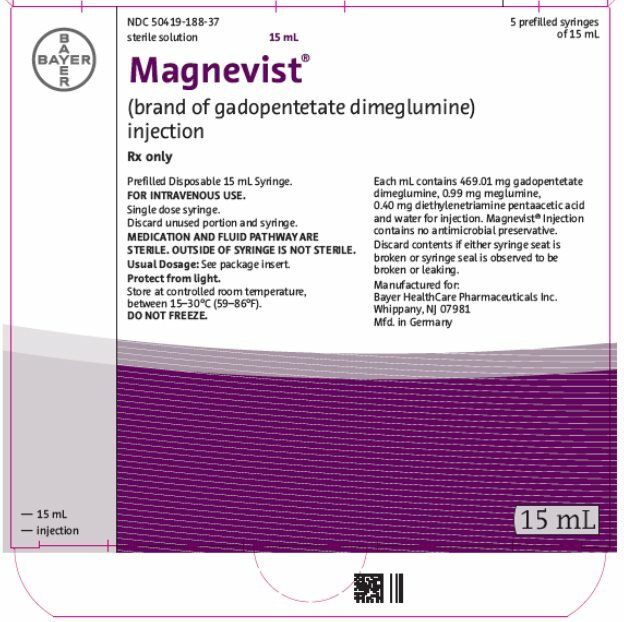 Magnevist® (brand of gadopentetate dimeglumine) injection is the N-methylglucamine salt of the gadolinium complex of diethylenetriamine pentaacetic acid, and is an injectable contrast medium for magnetic resonance imaging (MRI). Magnevist Injection is provided as a sterile, clear, colorless to slightly yellow aqueous solution for intravenous injection. Each mL of Magnevist injection contains 469.01 mg gadopentetate dimeglumine, 0.99 mg meglumine, 0.40 mg diethylenetriamine pentaacetic acid, and water for injection. Magnevist injection contains no antimicrobial preservative. Magnevist injection has an osmolality 6.9 times that of plasma, which has an osmolality of 285 mOsmol/kg water. Magnevist injection is hypertonic under conditions of use. Magnevist is a paramagnetic agent and, as such, it develops a magnetic moment when placed in a magnetic field. The relatively large magnetic moment produced by the paramagnetic agent results in a relatively large local magnetic field, which can enhance the relaxation rates of water protons in the vicinity of the paramagnetic agent. In magnetic resonance imaging (MRI), visualization of normal and pathological brain tissue depends in part on variations in the radiofrequency signal intensity that occur with 1) changes in proton density; 2) alteration of the spin-lattice or longitudinal relaxation time (T1); and 3) variation of the spin-spin or transverse relaxation time (T2). When placed in a magnetic field, gadopentetate dimeglumine decreases the T1 and T2 relaxation time in tissues where it accumulates. At usual doses, the effect is primarily on the T1 relaxation time. Disruption of the blood-brain barrier or abnormal vascularity allows accumulation of gadopentetate dimeglumine in lesions such as neoplasms, abscesses, and subacute infarcts. The pharmacokinetic parameters of Magnevist in various lesions are not known. The pharmacokinetics of intravenously administered gadopentetate dimeglumine in normal subjects conforms to a two compartment open-model with mean distribution and elimination half-lives (reported as mean ± SD) of about 0.2 ± 0.13 hours and 1.6 ± 0.13 hours, respectively. 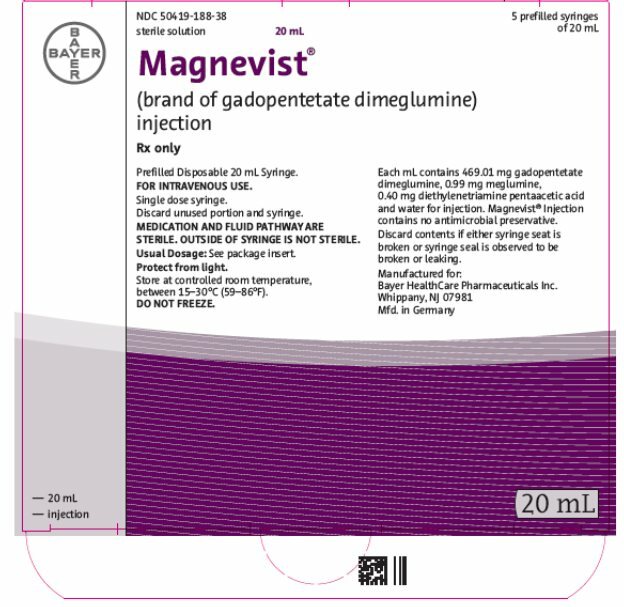 Upon injection, the meglumine salt is completely dissociated from the gadopentetate dimeglumine complex. Gadopentetate is exclusively eliminated in the urine with 83 ± 14% (mean ± SD) of the dose excreted within 6 hours and 91 ± 13% (mean ± SD) by 24 hours, post-injection. In vitro laboratory results indicate that gadopentetate does not bind to human plasma protein. In vivo protein binding studies have not been done. Magnevist is excreted via the kidneys, even in patients with impaired renal function. In patients with impaired renal function, the serum half-life of gadopentetate dimeglumine is prolonged. Mean serum elimination half-lives of a single intravenous dose of gadopentetate dimeglumine (0.1 mmol/kg) were 2.6 ± 1.2 h, 4.2 ± 2.0 h and 10.8 ± 6.9 h, for mildly (creatinine clearance, CLCR = 60 to < 90 mL/min), moderately (CLCR = 30 to < 60 mL/min) and severely (CLCR = < 30 mL/min) impaired patients, respectively, as compared with 1.6 ± 0.1 h in healthy subjects. Long-term animal studies have not been performed to evaluate the carcinogenic potential of gadopentetate dimeglumine. A comprehensive battery of in vitro and in vivo studies in bacterial and mammalian systems suggest that gadopentetate dimeglumine is not mutagenic or clastogenic and does not induce unscheduled DNA repair in rat hepatocytes or cause cellular transformation of mouse embryo fibroblasts. However, the drug did show some evidence of mutagenic potential in vivo in the mouse dominant lethal assay at doses of 6 mmol/kg, but did not show any such potential in the mouse and dog micronucleus tests at intravenous doses of 9 mmol/kg and 2.5 mmol/kg, respectively. When administered intra-peritoneally to male and female rats daily prior to mating, during mating, and during embryonic development for up to 74 days (males) or 35 days (females), gadopentetate caused a decrease in number of corpora lutea at the 0.1 mmol/kg dose level. After daily dosing with 2.5 mmol/kg suppression of food consumption and body weight gain (males and females) and a decrease in the weights of testes and epididymis were observed. Intravenous injections of gadopentetate dimeglumine (16 to 18 doses over 23 to 25 days) caused spermatogenic cell atrophy and degeneration in male rats at a dose of 5 mmol per kg; 8 times (based on body surface area [BSA]) the recommended human dose. Spermatogenesis was not affected in rats and dogs given repeatedly over 4 weeks at a dose of 2.5 mmol per kg or 4 times based on BSA (rats) and 14 times based on BSA (dogs) the recommended human dose. Magnevist injection was administered to 1272 patients in open label controlled clinical studies. The mean age of these patients was 46.4 years (range 2 to 93 years). Of these patients, 55% (700) were male and 45% (572) were female. Of the 1271 patients who received Magnevist injection and for whom race was reported, 82.1% (1043) were Caucasian, 9.7% (123) were Black, 5.3% (67) were Hispanic, 2.1% (27) were Oriental/Asian, and 0.9% (11) were other. Of the 1272 patients, 550 patients were evaluated in blinded reader studies. These evaluated the use of contrast enhancement in magnetic resonance imaging of lesions in the head and neck, brain, spine and associated tissues, and body (excluding the heart). Of the 550 patients, all patients had a reason for an MRI and efficacy assessments were based on pre-and post- Magnevist injection film quality, film contrast, lesion configuration (border, size, and location), and the number of lesions. The protocols did not include systematic verification of specific diseases or histopathologic confirmation of findings. Of the above 550 patients, 97 patients received 0.1 mmol/kg Magnevist injection IV in two clinical trials of Magnevist MRI contrast enhancement for body imaging. Of these 97, 68 had MRIs of the internal organs/structures of the abdomen or thorax (excluding the heart); 8 had breast images and 22 had images of appendages. The results of MRIs before and after Magnevist use were compared blindly. Overall additional lesions were identified in 22/97 (23%) of the patients after Magnevist injection. The mean number of lesions identified before (1.49/patient) and after Magnevist (1.75/patient) were similar. Seven (8%) of the patients had lesions seen before Magnevist that were not seen after Gadopentetate dimeglumine. Overall, after Magnevist injection, 41% of the images had a higher contrast score than before injection; and 18% of the images had a higher contrast score before Magnevist injection than after Magnevist injection. Magnevist MRI of the 8 patients with breast images were not systematically compared to the results to mammography, breast biopsy or other modalities. In the 22 patients with appendage images (e.g., muscle, bone and intraarticular structures), Magnevist MRI was not systematically evaluated to determine the effects of contrast biodistribution in these different areas. Of the above 550 patients, 66 patients received Magnevist 0.1 mmol/kg IV in clinical trials of Magnevist MRl contrast enhancement of lesions in the head and neck. A total of 66 MRI images were evaluated blindly by comparing each pair of MRI images, before and after Magnevist injection. In these paired images, 56/66 (85%) had greater enhancement after Magnevist and 40/66 (61%) had better lesion configuration or border delineation after Gadopentetate dimeglumine. Overall, there was better contrast after Magnevist in 55% of the images, comparable enhancement in 44 (36%) before and after Gadopentetate dimeglumine, and better enhancement in 9% without Gadopentetate dimeglumine. In the studies of the brain and spinal cord, Magnevist 0.1 mmol/kg IV provided contrast enhancement in lesions with an abnormal blood brain barrier. In two studies, a total of 108 patients were evaluated to compare the dose response effects of 0.1 mmol/kg and 0.3 mmol/kg of Magnevist in CNS MRI. Both dosing regimens had similar imaging and general safety profiles; however, the 0.3 mmol/kg dose did not provide additional benefit to the final diagnosis (defined as number of lesions, location, and characterization). Magnevist injection should be stored at controlled room temperature, between 15 - 30° C (59 - 86° F) and protected from light. DO NOT FREEZE. Should freezing occur in the vial, Magnevist injection should be brought to room temperature before use. If allowed to stand at room temperature for a minimum of 90 minutes, Magnevist injection should return to a clear, colorless to slightly yellow solution. Before use, examine the product to assure that all solids are redissolved and that the container and closure have not been damaged. Should solids persist, discard vial. Instruct the patients to contact their physician if they develop signs or symptoms of NSF following Magnevist administration, such as burning, itching, swelling, scaling, hardening and tightening of the skin; red or dark patches on the skin; stiffness in joints with trouble moving, bending or straightening the arms, hands, legs or feet; pain in the hip bones or ribs; or muscle weakness. • Advise patients that gadolinium is retained for months or years in brain, bone, skin, and other organs in patients with normal renal function. The clinical consequences of retention are unknown. Retention depends on multiple factors and is greater following administration of linear GBCAs than following administration of macrocyclic GBCAs [see Warnings and Precautions (5.3)]. © 1988, Bayer HealthCare Pharmaceuticals Inc. All rights reserved. 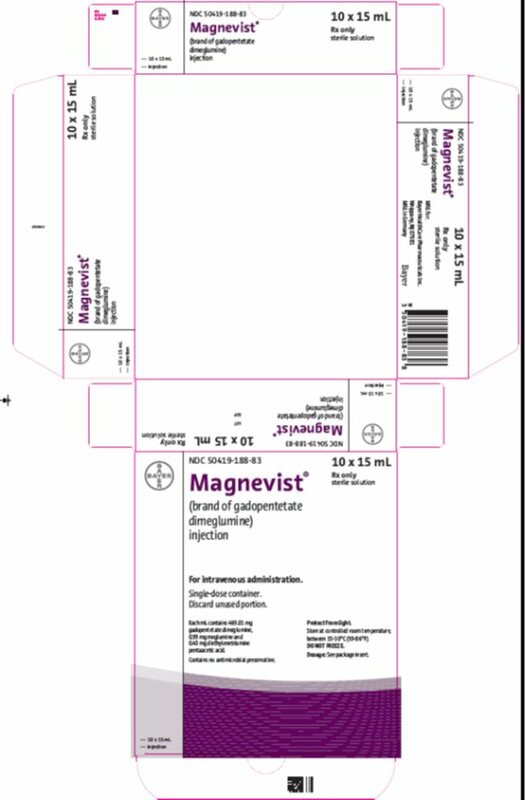 • Magnevist is a prescription medicine called a gadolinium-based contrast agent (GBCA). Magnevist, like other GBCAs, is injected into your vein and used with a magnetic resonance imaging (MRI) scanner. • An MRI exam with a GBCA, including Magnevist, helps your doctor to see problems better than an MRI exam without a GBCA. • Your doctor has reviewed your medical records and has determined that you would benefit from using a GBCA with your MRI exam. What is the most important information I should know about Magnevist? • Magnevist contains a metal called gadolinium. Small amounts of gadolinium can stay in your body including the brain, bones, skin and other parts of your body for a long time (several months to years). • Rarely, patients can feel pains, tiredness, and skin, muscle or bone ailments for a long time, but these symptoms have not been directly linked to gadolinium. • Some people with kidney problems who get gadolinium medicines can develop a condition with severe thickening of the skin, muscles and other organs in the body (nephrogenic systemic fibrosis). Your healthcare provider should screen you to see how well your kidneys are working before you receive Magnevist. Do not receive Magnevist if you have had a severe allergic reaction to Magnevist. • are pregnant or plan to become pregnant. It is not known if Magnevist can harm your unborn baby. Talk to your healthcare provider about the possible risks to an unborn baby if a GBCA such as Magnevist is received during pregnancy. What are the possible side effects of Magnevist? • Allergic reactions. Magnevist can cause allergic reactions that can sometimes be serious. Your healthcare provider will monitor you closely for symptoms of an allergic reaction. The most common side effects of Magnevist include: headache, nausea, injection site coldness/localized coldness, and dizziness. These are not all the possible side effects of Magnevist. General information about the safe and effective use of MAGNEVIST. Medicines are sometimes prescribed for purposes other than those listed in a Medication Guide. You can ask your healthcare provider for information about MAGNEVIST that is written for health professionals. What are the ingredients in Magnevist? For more information, go to www.magnevist.com or call 1-888-842-2937. Each mL contains 469.01 mg gadopentetate dimeglumine, 0.99 mg meglumine and 0.40 mg diethylenetriamine pentaacetic acid. Protect from light. Store at controlled room temperature, between 15-30°C (59-86°F). DO NOT FREEZE. Store at controlled room temperature, between 15-30°C (59-86°F). DO NOT FREEZE. Prefilled Disposable 10 mL Syringe. Discard unused portion and syringe. MEDICATION AND FLUID PATHWAY ARE STERILE. OUTSIDE OF SYRINGE IS NOT STERILE. Protect from light. Store at controlled room temperature, between 15â€“30°C (59â€“86°F). DO NOT FREEZE. Each mL contains 469.01 mg gadopentetate dimeglumine, 0.99 mg meglumine, 0.40 mg diethylenetriamine pentaacetic acid and water for injection. Magnevist® Injection contains no antimicrobial preservative. Discard contents if either syringe seat is broken or syringe seal is observed to be broken or leaking. Prefilled Disposable 15 mL Syringe. Prefilled Disposable 20 mL Syringe.